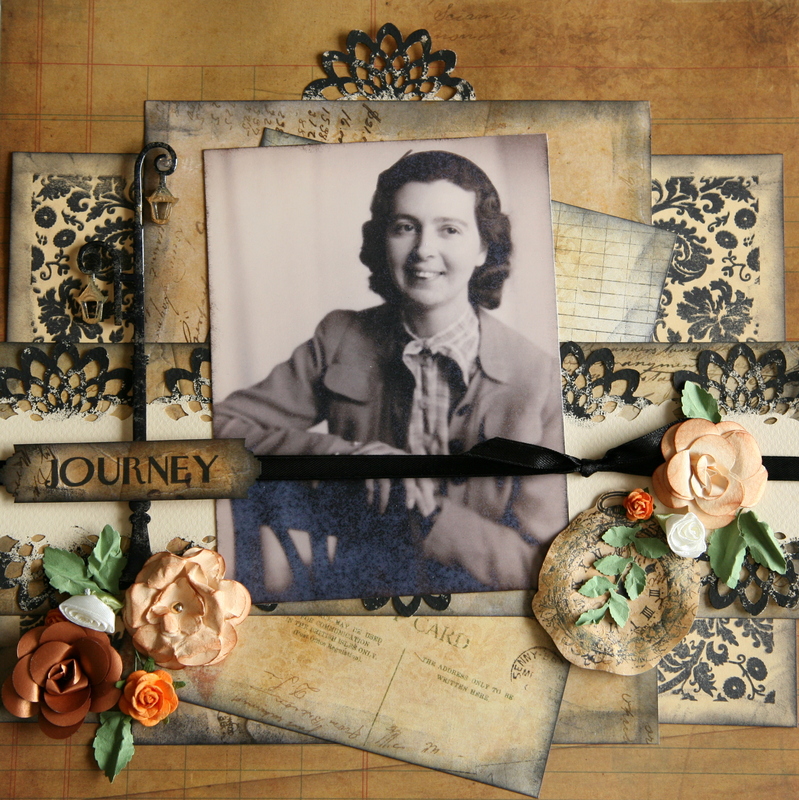 Although I have been writing and scrapbooking for several years, since I began writing a scrapbooking novel the two have become very much entwined and I can’t think about one without thinking of the other. Soon I am about to embark on the exciting journey of self-publishing my first novel, which is in the final stages of editing before I submit it to Abbott Press. It has taken a little longer to get there than planned, however, due to unforeseen circumstances. Last year I broke my wrist after slipping from a wooden ledge around the edge of our raised vegetable garden. My arm was in a cast for three months and I had to learn how to do everything with one hand while having to rely on others for help. Luckily I was still able to write stories—one-handed typing on the computer—but all crafts were put on hold for a while, which was very frustrating. My fingers were so swollen that it took another three months of physio after the cast came off to get my fingers and wrist working again. By Christmas time I was ready to get creative again. During a visit to my local scrapbooking store, Scrapbook Corner, for some supplies to make Christmas cards, I saw one of Jo’s wonderful layouts on display and was inspired to sign up for one of her classes. It was a fun afternoon and I learned several new techniques including how to make dimensional flowers, which gave an elegant look to the page. The heritage look of the layout Jo had designed made it perfect for the photo I wanted to use of my great aunt Marili, who passed away last year, aged 96. Music was a big part of Marili’s life—she was a pianist and a music teacher—and I wanted to convey this in a layout, so I made another page using a similar colour scheme with music-themed papers and embellishments. I repeated some of the same elements used in the first layout, such as the layered papers and the black ribbon across the page, and it gave me a chance to practice making paper flowers, which is a lot of fun and becoming easier the more I do. Two things I learned in the last few months—how to make dimensional flowers, and to step carefully in the garden. 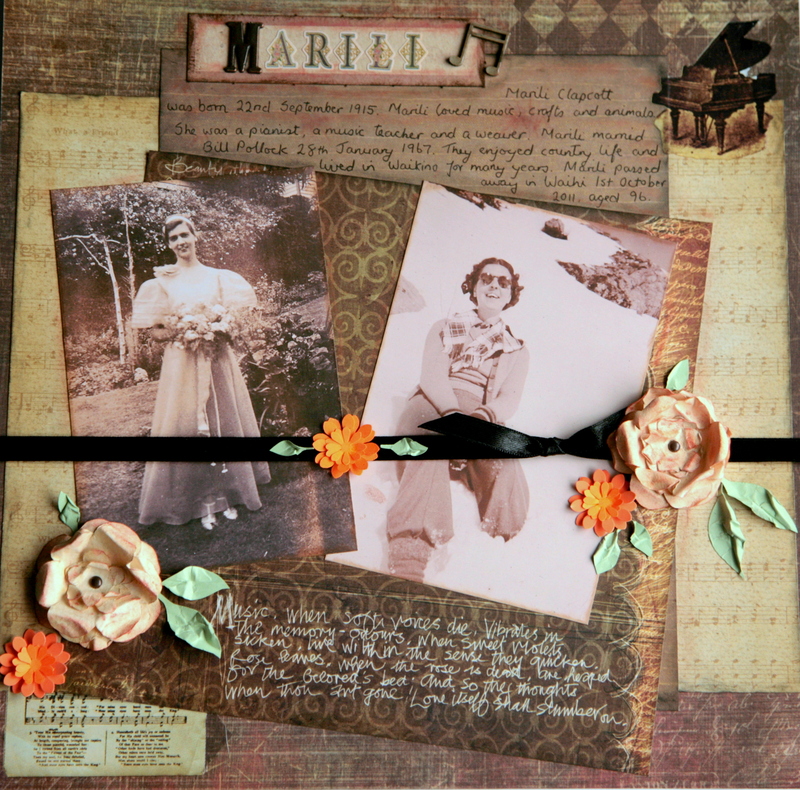 This entry was posted in My Blog, Scrapbooking and tagged broken wrist, dimensional flowers, marili, scrapbook corner, scrapbooking, scrapbooking store, writing. Bookmark the permalink.